London Pearl Limited has been trading for over 30 years. On the 1st October 2010 Daniel Vecht, who had been working for London Pearl for over 20 years, purchased the company and proceeded to trade as London Pearl Limited. All the European staff of the original company now work for London Pearl Limited. We exhibit in most of the major jewellery trade shows worldwide. London Pearl Limited specialise in supplying large retail groups as well as other pearl importers. As we source directly from the farms we are confident that we can offer pearls at prices substantially below our competitors. 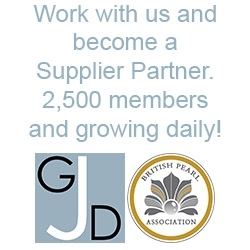 London Pearl Ltd are pleased to offer a 10% discount on pearls to subscribing Gold members of the Guild of Jewellery designers - Please contact us with your membership number when placing an order. 10% Discount to Gold GoJD members.